I've read a number of topics on the subject but none have been able to help. I used to have 1 ATI Radeon 4650 and recently bought another. I plugged it in, enabled crossfire in CCC, launched some games to test the setup and NADA - they lag immensely and the overall performance is significantly worse than that of just my old 4650. Is one DDR2 and the other DDR3 by any chance? Yes, that's right - I checked GPU-Z and it says my old one is GDDR3 and my new one is DDR2. Is that bad news? Yes, that is bad news. The DDR3 card is significantly faster than the DDR2 card and in crossfire the DDR3 card is going to match it's speed to the DDR2 card. Essentially you are adding a lot of processing power but also then removing the memory bandwidth it needs to function properly. I think that may be overstating the difference a little but even so it's not good. Thanks a lot for the explanation Jyjjy - that really is unfortunate. However, should the memory bandwidth really be bottlenecking the overall performance to such a degree? Is there any way to solve this problem? Is there any test I can run to see if this is what's actually happening? GPU-Z perhaps? Thank you very much for your help! Number 1 rule in Crossfire or SLI, 2 low end cards will still give you low end performance, that is all there is to say about that. They may improve performance, but the performance improvement is not always somewhere you will see it. For instance, I am sure that higher res gaming is improved, but you have to be relevant about it. Sure enough, if you are gaming at 1920x1280, and you are only getting 10fps with your 4650, adding another might get you to 20 fps, which is still terrible. If you are gaming at 1280x1024, or less, then adding another card for won't do much for you anyway, at those resolutions, you simply need a more powerful card if 1 card isn't doing it. 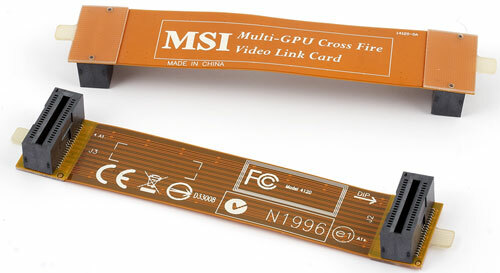 Crossfire and SLI can be very beneficial, but you have to take other things into consideration. Just to add something, you need to download from ATI the Crossfire Profiles. And make sure to only use 1 crossfire bridge. If you use 2, it can cause issues. Also make sure you have your CCC 3D settings set to "use application settings" in all the relevant areas, and try Catalyst A.I. on either Advanced or Standard. Also, might be worth trying different driver versions. If you're on 10.6, try 10.4. Or update to 10.6 first if you're not currently using them. Thanks for the advice but I already tried playing around with the settings and they are currently set to what you specified. I was on 10.3 previously and just upgraded to 10.6. Also, I'm not sure if we're talking about the same thing but I don't think the 4650 crossfire requires a bridge - it just works by itself. Thanks a lot everyone - I hope you can help me figure out some way to make this work! And also activate CF in CCC. I also do have crossfire turned on in CCC. You don't need the bridge because low end cards like this "talk" through the PCIe bus. No higher speed link is needed. If you want to test, try this. Use fraps and record what your DDR3 card can do by itself. Switch cards and see what the DDR2 card can do. Remember that you will at best double THIS score. If your DDR3 card can do 30FPS, while your DDR2 card can only do 12FPS, you don't get 42FPS (30 + 12), but 24FPS (12 x 20. This is bad ofcourse because it's worse then what the DDR3 card can do by itself. So what would you say the verdict is? No way to speed up the DDR2? Is it just better to stay with the GDDR3 and forget about the DDR2? Thanks! If you are using such a high resolution then I'm not surprised the drop in memory bandwidth is making performance worse despite 2 cards. 128 bit + DDR2 simply has no business trying to move the kind of data necessary for gaming at 1920x1200. Sure enough, if you are gaming at 1920x1280, and you are only getting 10fps with your 4650, adding another might get you to 20 fps, which is still terrible. If you are gaming at 1280x1024, or less, then adding another card for won't do much for you anyway, at those resolutions, you simply need a more powerful card if 1 card isn't doing it. Why would crossfire be less effective at low resolutions? If anything the opposite is true as higher resolutions need more memory and higher memory bandwidth. In crossfire the memory subsystems are redundant so you aren't gaining anything there by adding a second card. Crossfire just adds more processing power which is useful at any resolution unless the card is being bottlenecked by the CPU or your memory bandwidth is too low to make use it, which is the OPs problem. You could try OCing it, but I doubt it would help much. Single DDR2 card was 9-14FPS, or around 12FPS. Adding another card would at best double it, so your looking at around 24FPS. This is consistent with what you were seeing in CF. I would say everything is working fine. So what to do? First, return/sell the DDR2 card. As you've learned there is no point in slowing down the faster card. You might also want to sell the DDR3 card and use all that $$$ to buy a single faster card. A 4650 really isn't the card you want for gaming at 1080/1200. To really max everything out you'd want the 5850 which I'm assuming is more then you want to spend. I'd consider getting the 5750/5770. Should be around $100-$150 if you buy online, and will make most everything look good. Yeah, at your resolution you should just save up some, ebay both HD4650s and grab an HD5770. Thanks a lot for your help everyone! Thanks again for all your tips and help in resolving all this! Best answer selected by lucky-nz.